OLD IRVING PARK — Not all coffee drinkers were created equal. Recognizing that some people need a bigger hit of caffeine than others to get their java buzz on, Berrista Coffee, opening Friday, is prepared to offer customized brews. "You need three times the jolt, we can give you a certain pick-me-up," said Homaro Cantu, Berrista's owner. Called "Chicago's other cutting-edge chef" by the New York Times — the first being Grant Achatz at Alinea — Cantu, the chef behind Moto and the recently shuttered iNG, is one part mad scientist, one part cook, so it's no surprise that Berrista is as much a laboratory as a cafe. The kitchen is stocked with gadgets like the Steampunk coffee press, which is controlled by an Android tablet and can produce cups of coffee to order. And then there's the "miracle berry" — a fruit containing a protein that makes sour things taste sweet — which will feature prominently in Berrista's menu offerings, part of Cantu's bid to revolutionize the concept of "fast food." A chicken and waffle sandwich, for example, will come with a side container of miracle berry, lemon juice and water that Cantu said would taste similar to maple syrup. Doughnuts, similarly enhanced with the miracle berry, can be made sugar-free. Cantu said he's also developing a gluten-free formula. "We're working on some great inventions," he said. 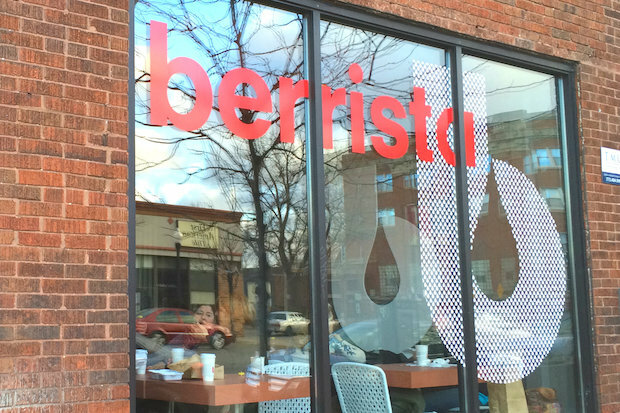 Given Cantu's reputation for experimentation, anticipation surrounding Berrista has been running high since the chef announced plans for the coffee shop in late 2013. "We've been watching the storefront for months," said Katherine Bissell-Cordova, just one of the Old Irving Park residents who turned out for a friends-and-family preview of Berrista over the weekend. "It all sounds kind of wacky, but knowing he's behind it ...," she said. Digging into a scone after polishing off a sandwich, her 9-year-old son, Mateo Cordova, proclaimed the place "awesome." "I like how they make it fast, but it's not fast food," said the junior Cordova, a classmate of Cantu's children at Disney II magnet. 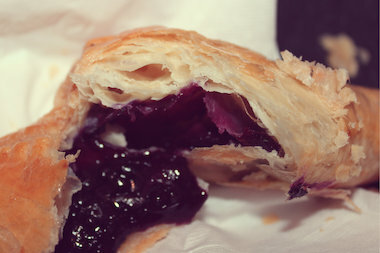 Berrista's pastries, like this blueberry turnover, will be made with and without sugar. Owner Homaro Cantu's goal is to provide a healthier alternative to fast food. Young Mateo's enthusiasm was matched by the rest of the preview customers, who descended on Berrista in such large numbers, Cantu had to push the coffee shop's debut back from Dec. 8 after literally being eaten out of business and needing to take a breather to restock. "That was a little crazy," Cantu said of the soft opening. "I think we did like 800 people. We didn't expect that." During the preview, few were able to sample the miracle berry, or "magic bean," as Cantu calls it. "We ran out of all that after the first 50 people," said the chef. "We were just trying to make food." Melissa Arning and James Pulker, latecomers to the preview, were disappointed to have missed out on the doughnuts, but had previously tried the miracle berry at a party with friends. "The way it completely changes flavors is nuts," said Pulker. Greek yogurt tasted like cheesecake, they said, and salt and vinegar chips like kettle corn. But it was Berrista's other bean — the coffee kind — that was most likely to earn their repeat business, they said. "Old Irving Park in general is kind of underserved" by independent coffee shops, said Arning, who's been eagerly following Berrista's progress for the past year. She also said she appreciated the diverse array of available brews — Bowtruss, Big Shoulders, Intelligentsia and La Colombe — versus most coffeehouses' habit of associating themselves with a single brand. "This'll be a place to super-impress any relatives from out of town," Pulker said. Longtime neighborhood residents Gerta Sorensen and Jeff London, who split one of Berrista's super-sized flatbreads, were excited to have a new dining option within walking distance, and said they were hopeful more entrepreneurs of Cantu's caliber would follow the chef's lead. "When you have someone of Homaro's stature open a business here, it shows you can bring an upscale concept to this neighborhood," Sorensen said. Berrista Coffee, 4219 W. Irving Park Road, will be open as of Friday, 6 a.m. to 9 p.m. weekdays; 6 a.m. to 1:30 p.m. Saturdays; closed on Sundays.